As a Tera DPS Brawler generates far more aggro than any dedicated dps class resulting in potential aggro swaps. The gear changes required to dps with Brawler are a use of Bitter and Savage to replace Pounding and Wrathful, % behind damage and % damage on a weapon to replace %highest aggro damage and 0.3 crit power, % HP on the chest to replace % highest aggro. 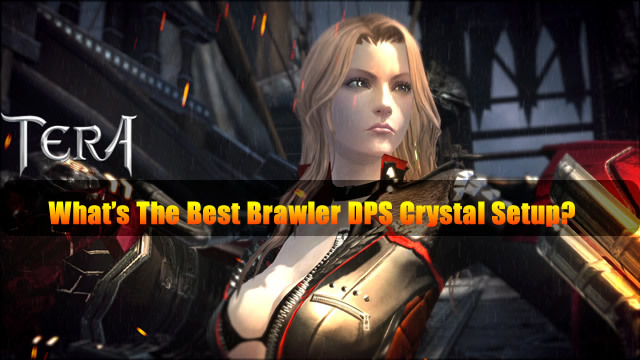 Compared to dedicated dps classes, Brawler provides mid-tier dps in Tera. The frontal block effect of Growing Fury allows dps Brawlers to carry on using skills through boss attacks/mechanics that most other classes would have to avoid. Note that the frontal block effect of Growing Fury only applies to yourself, however skills with the innate frontal block such as Counterpunch and Ground Pounder protect nearby party members. In addition, dps Brawlers can support the party by using Infuriate to enrage the boss for higher enrage uptime in Tera. Compared to a tank Brawler, there are generally fewer block opportunities from behind, hence there is a dps loss due to fewer perfect blocks and reduced availability of Counterpunch. However, this is more than balanced out by the higher crit power and crit chance for backcrossing. Dps brawler should do ~25% more dps than tank Brawlers. For weapon crystals, Focused and Wrathful are mandatory as they increase crit power by a large amount resulting in a large dps gain (~25% and ~40% respectively). Pounding crystals give ~6% dps. The diminishing nature of carving scaling means that its value is much lower than it would seem. Although most Brawler skills benefit from carving due to carving scaling with crit glyphs, its value is greatly diminished as Counterpunch, Haymaker, One-inch Punch, and Ult have 100% crit chance. At ~300 crit factor, Carving is worth ~4% dps. Hence Brawlers should use two Pounding weapon crystals. With weapon dyads, Poised secondary effects are very powerful due to the addictive nature of damage reduction, especially on bosses with high enrage uptime e.g. Vergos Phase 4. Relentless weapon crystals provide flat HP and are a reasonable alternative. For armor crystals, it is mandatory to use four Hardy crystals due to how damage reduction is additive. If the boss has 100% enrage uptime e.g. Vergos Phase 4, one of the Hardy crystals may be replaced with a Poised. For armor dyad secondary effects, Brutal is the only one that increases damage, however, this is rarely utilized as few bosses can be knocked down. For accessory crystals, either Keen vyrsks (6 crit factor) or Power vyrsks (3 power) should be used.